Wireless Internet Service Providers (WISP) provide broadband wireless internet connections wherever traditional ADSL, cable or satellite services are either unavailable or uncompetitive. WISP networks demand low-cost but highly-reliable equipment to provide “xDSL equivalence” of service with upgrade path for modern services demanding Quality of Service (QoS) such as VOIP, VOD and IPTV. WISP networks typically use licensed 3.5GHz or unlicensed 2.4 or 5.3/5.8GHz frequencies to provide connectivity both to end-users and for the back-haul network. Additionally, FSO links may be used in the network for short-range, high capacity links. In comparison with existing solutions CableFree provides high-capacity, highly reliable and rich-feature-set wireless products with high levels of integration and low cost of ownership. Extended frequency ranges of 2.3-2.5 and 4.9-6.1GHz are available. CableFree products offer up to Gigabit capacity, low costs, advanced feature-set compared to existing radio offerings and are installed in hours, not weeks. 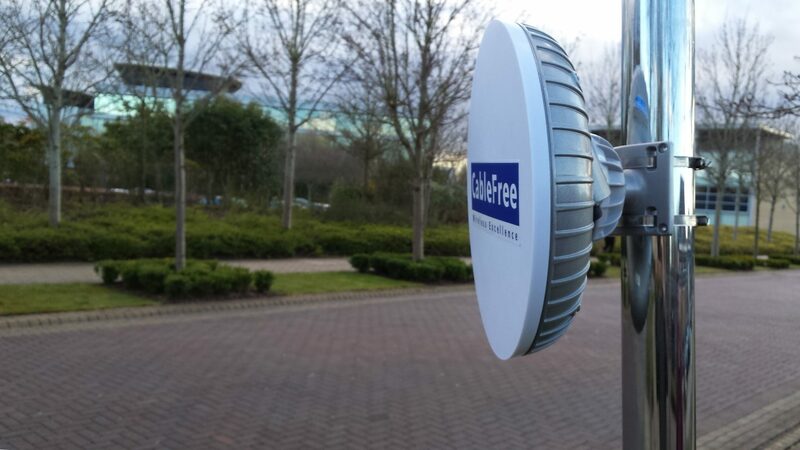 For radio, CableFree supports both proprietary MIMO OFDM radios as well as standards-based LTE technologies, as well as licensed and unlicensed band operation.